NASA's Mars rover Curiosity captured this composite image, which looks toward the higher regions of Mount Sharp, on Sept. 9, 2015. NASA's Mars rover Curiosity has flexed some new scientific muscles, likely solving a Red Planet puzzle in the process. Mission team members repurposed the rover's navigation gear to measure tiny variations in gravitational fields, a new study reports. This novel strategy allowed the researchers to figure out how the huge Martian mountain whose base Curiosity is exploring formed — namely, that it was probably built up as a free-standing mound by the deposition of windblown sand and sediment. "It really gives you data about the subsurface, which is hard to get from any other instruments," Lewis told Space.com. The car-size Curiosity rover landed on the floor of the 96-mile-wide (154 kilometers) Gale Crater in August 2012, tasked with investigating the area's past potential to host life. This work has been incredibly fruitful; Curiosity's observations show that Gale harbored a lake-and-stream system for long stretches — perhaps hundreds of millions of years at a time — in the ancient past. Gale Crater is intriguing for other reasons as well. For example, a mountain rises 3.4 miles (5.5 km) into the Martian sky from its center — a dramatic geological oddity that has no close parallel here on Earth. Scientists have long debated just how this odd massif, known as Mount Sharp, took shape. Is it the remnant of a sedimentary structure that once filled Gale Crater but was worn away by erosion? Or did Mount Sharp coalesce in its current form, growing as Martian winds dropped dirt and sand into Gale Crater? Measurements using the Curiosity Mars rover's engineering accelerometers (gray) show a decrease in the strength of gravity as the rover climbs Mount Sharp. The rate of decrease of the modeled gravity signal (black) allowed researchers to measure the density of the rocks that make up Mount Sharp. "It's probably more like a compacted soil than what you might think of as a nice, really well-cemented rock," Lewis said. If these deposits had once been buried under 3 miles (5 km) of other sediments, they would almost certainly be much denser, he added. So, the new results argue that Mount Sharp was primarily built up by wind-blown deposits, not pared down from a crater-filling feature. This isn't to suggest that a potentially habitable lake didn't once occupy Gale Crater's floor; Curiosity's observations of lakebed sediments have established this water body's past existence with high confidence, Lewis stressed. But those sediments apparently didn't go all the way to the crater rim. It remains unclear how high they got — where the transition between lake sediments and windblown deposits lies on Mount Sharp's slopes. 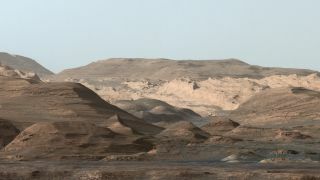 Orbital observations have identified an intriguing "unconformity" — a break in the previously continuous sedimentary-rock record — about 2,600 feet (800 m) above Curiosity's current location, Lewis said. So, that region is a candidate. "We'll see if Curiosity makes it up there, or if we get pieces of that upper unit that roll down the mountain," Lewis said. "But we may have to do a bit more exploring to find such a transition." But let's get back to the gravity data. Curiosity doesn't carry any dedicated gravimetry instruments, so how did Lewis and his team make their measurements? By thinking outside the box. Curiosity has two "rover inertial measurement units" (RIMUs), a primary and a backup. Both RIMUs consist of three accelerometers and three gyroscopes, which the rover's handlers normally use for navigation and to determine Curiosity's orientation in space. But Lewis wondered if these engineering data could be recalibrated to capture information about gravitational fields. "It's something that I had thought about it for a long time," he said. "I didn't expect to have precision that was high enough to be able to use for science purposes. But I started looking into the data and calibrating out some of the complicating factors, like temperature and some other variables. And, lo and behold, it got to the point where the precision was actually scientifically meaningful." The team was therefore able to build up the first-ever "gravity traverse" on the surface of another planet. The only other such work done off Earth was performed on the moon, by the Apollo 17 astronauts in 1972, Lewis said. Future rover missions to Mars and other planets could make similar measurements, Lewis said. But the strategy his team used isn't universally applicable. For example, researchers probably cannot dredge gravimetry measurements out of the engineering data gathered over the years by NASA's Spirit and Opportunity Mars rovers. Those two golf-cart-size robots collected their engineering data in a slightly different way, Lewis said.